Redlining has taken its toll on property values. But not in every city. Redlining Has Taken a Huge Toll on Property Values. But Not Everywhere. Redlining’s effects in Atlanta are still strongly felt. More than 80 years ago, the federal Home Owners’ Loan Corporation released its “Residential Security” maps, guides of American cities for lenders and brokers infamous for the color they used to condemn black neighborhoods to decades of disinvestment: red. The four-tiered HOLC maps worked to both hamper black home-buying and quash its gains, setting in motion a racial disparity in home values that helps explain today’s racial wealth gap. In some cases, redlining reflected the overcrowded housing conditions characteristic of American ghettos, where black families—denied access to most of the city—were forced to pay exorbitant rates for substandard apartments. But in other cases, the designation simply marked the presence of any black residents at all. Older ethnic neighborhoods with a mix of residences and businesses, such as Manhattan’s Lower East Side and Boston’s South End, were also redlined. The 2016 Mapping Inequality project, produced by the University of Richmond’s Digital Scholarship Lab and a whole host of other researchers, knitted the HOLC maps together in a searchable digital interface. Zillow has used that project to show how the correlation between home values and redlining endures, 50 years after the 1968 Fair Housing Act outlawed the practice. Nationally, the median home value in redlined areas is $276,100, compared with $324,489 outside of them—a difference of nearly $50,000. How much of this is actually due to redlining, rather than just correlated with it? Researchers from the Federal Reserve Bank of Chicago, also working off of Mapping Inequality, estimated in August that although HOLC maps did sometimes describe conditions on the ground, they also determined what would happen. The team showed that redlining alone accounted for 15 to 30 percent of the gap in segregation and homeownership between redlined, or D-grade, areas and yellow, or C-grade, neighborhoods. (Other studies have shown similar long-term causation related to redlining.) But those researchers came away with another interesting finding: The effects of redlining have decreased since the passage of the Fair Housing Act, and differences in home values and homeownership have largely dissipated between D and C areas—and are now more pronounced between C and B areas (blue on the old HOLC maps). What’s most striking about the Zillow data is how much variation there is between cities. Researchers from the National Community Reinvestment Coalition had previously determined that redlined neighborhoods in Sun Belt cities were more likely to have remained segregated, despite evidence of the region’s general integration. They also found redlined neighborhoods in the South and West still had the highest degrees of economic inequality. In Tampa and Atlanta, Zillow found that homes redlined in the 1930s aren’t worth even half as much as neighboring properties. In Baltimore, Dallas, Miami, and Detroit, the value is only just higher than half. The largest dollar gap—more than $500,000—not surprisingly is in the super-expensive California market of Los Angeles, with San Francisco close behind. One thing several of those cities have in common: high postwar growth. What was redlined in the 1930s today marks a very small fraction of the city. Then there are cities like Seattle, Columbus, New York (Manhattan only), and St. Louis, where home prices don’t really change in and out of redlined areas. 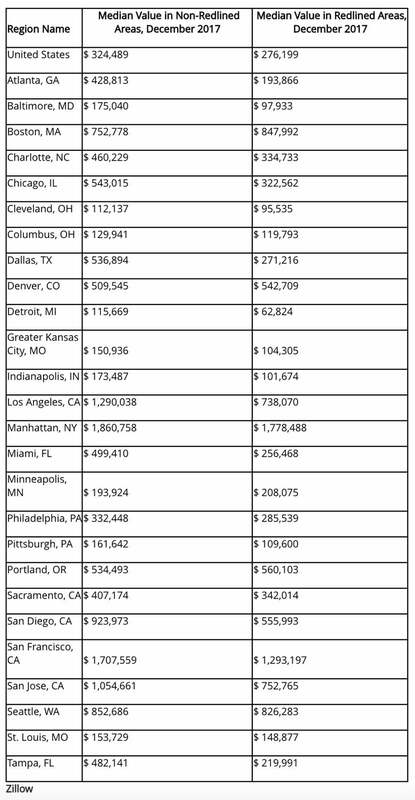 And finally, we’ve got Denver, Portland, Boston, and Minneapolis, cities in which redlined homes are worth more now than their nonredlined counterparts. All four had very small black populations in 1940, indicating that the old HOLC maps may not have neatly matched up to the ensuing decades of racially motivated disinvestment. And three of those cities—Denver, Portland, and Minneapolis—ranked among the top five American cities for tracts that gentrified between 2000 and 2010.